Google has integrated virtual keyboards into its search, allowing people to conduct searches on computers not set up for different languages. Google points out that more and more people want to formulate searches in their own language on keyboards that are set up with English letters. The search giant's solution is to integrate virtual keyboards for those who need different characters. 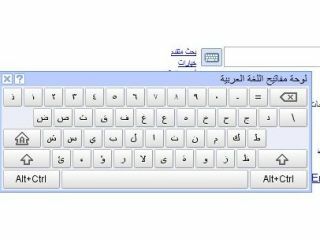 "A virtual, or 'on-screen' keyboard, lets you type directly in your local language script in an easy and consistent manner, no matter where you are or what computer you're using," explains Google. "Last year, to make text input easy for people across the globe, we introduced a virtual keyboard API through code.google.com. "This allowed developers to enable virtual keyboards on any text field or text area in their webpages. "Today, we are taking this effort one step further by integrating virtual keyboards into Google search in 35 languages." The keyboard is accessed from an icon, if you want to use one of the languages that are currently supported. We'd put some clever translated text in this last line, but our content manager won't support it.